Why Are We Waging War on the People of Yemen? The history of this conflict is emblematic of others in the Arab world. The background: a close US ally, Saudi Arabia, supports - to the tune of billions of dollars - a strict and violent version of the Sunni branch of Islam (Wahhabism). "Saudi Arabia's export of Wahhabi puritanical Islam has been one of the worst things to happen to Muslim and Arab pluralism," according to New York Times columnist Thomas Friedman. Moderate Muslims have been largely unable to resist this trend. Bader Al-Din Al-Houthi, a Zaydi religious leader in Yemen who objected to spreading Wahhabism in Sa'da, the heartland of Shia Zaydi Islam, was assassinated in 2004. This led to a series of wars between the Houthis and the Yemeni government, along with its Saudi backers. In 2014, Houthi forces took control of the capital and forced out its president. In March 2015, after several rounds of peace negotiations, the UN envoy to Yemen announced that the Yemeni factions were on the verge of a power sharing deal. Ignoring that announcement, Saudi Arabia and a "coalition force" of ten Arab nations, backed by the US and the UK, launched an all-out air campaign against Yemen. The aim of the effort was ostensibly to return President Hadi to power and rid Yemen of the Houthis, regarded by the Saudis as a proxy for their regional rival, Iran. The emotional impact of the Saudi war on non-combatants is staggering. Indiscriminate airstrikes at all times of the day and night are terrifying. Yemen's capital city has been largely reduced to rubble by Saudi Arabia's continuing air strikes, with residents describing “huge explosions” and buildings shaking as if they were in the “centre of an earthquake”. Kommentar: Kurze Beschreibung der Lage. Für Mainstream-Leser vielleicht noch etwas Neues, wer es wissen wollte, wusste es seit 8 Monaten. It's a war that has killed thousands of civilians and displaced hundreds of thousands more, but remains out of sight and out of mind for most of the world. Destruction in Yemen has been on an epic scale. A new, intensive phase of the war began in March this year and escalated as a Saudi Arabia-led coalition launched a relentless air campaign. An estimated 1.5 million people have been displaced, according to the International Committee of the Red Cross (ICRC). Doctors Without Borders (MSF) now describes the Yemen conflict as the worst destruction it has ever seen. And a recent ICRC report declared: "After five months, Yemen looks like Syria after five years." Countless neighbourhoods have been levelled by 500 to 2,000-pound bombs dropped by fighter jets. Schools and mosques have been hit and power and water are always in short supply in many parts of the country. Many families are now in refugee camps outside the cities and towns they once called home. Yemen has become an island, caught between the area controlled by Al Qaeda in the Arabian Peninsula (AQAP) in the west of the country, a blockaded coast line and a belligerent Saudi Arabia on its northern border. Escape is impossible or elusive for hundreds of thousands wanting to flee the conflict. Chronically overburdened, Yemen's health system can barely cope. With medical facilities either bombed completely or substantially damaged, the nation's sick and injured must also endure the devastating impact of the blockade. Many school buildings are no longer used for education, with classrooms now providing shelter for those displaced by a war that has crippled an already debilitated nation. After walking for almost three days, Ali Nasser Ahmed, his heavily pregnant wife and his family arrived at the Khamer refugee camp. Ali's wife gave birth under the stars. "We can only thank god there were no complications," Ali says. But the family with a newborn had no permanent shelter. "It was really bad because then we did not even have a tent, some people who were here gave us shelter and pillows and blankets," Ali says. The blitzkrieg invasion has stalled with the Saudi and UAE militaries now caught in a quagmire similar to those experienced by the U.S. in both Iraq and Afghanistan. Diplomatic efforts have been ineffective and only exacerbate tensions on all sides. If not addressed Yemen’s humanitarian crisis will increase in magnitude, further stress diminishing international aid, and ultimately intensify the paralyzing refugee catastrophe. Yemen’s contemporary challenges are complex due to its history, politics, geography, and regional influences. The lack of a legitimate central government, national identity, and infrastructure to support economic development create deep political, economic, and ethnic fissures. More than 300,000 people have been displaced by the fighting, and approximately 80% of Yemen’s 20 million people are in dire need of food, water, and medical aid. The Saudi campaign has been labeled a “humanitarian disaster”. The greatest problem with Yemen is that it has never been about Yemen. Yemen continues to experience the same phenomenon with regards to foreign influence. Whether the Ottoman’s land grab for the glory of empire, the British desire to secure a path to India vis-à-vis Aden, or the Saudi agenda to curb Shi’a (Iranian) influence, it has always been the stepping stone to another objective. This trend continues in Yemen today. U.S. foreign policy is torn between supporting its Gulf allies, curbing a burgeoning humanitarian catastrophe, and combating al-Qaeda in the Arabian Peninsula (AQAP). The Obama administration is providing logistic, intelligence, and targeting support to the Gulf coalition; while the Saudis continue to run the same U.S. interventionist playbook that brought failure to Iraq and Afghanistan. Forgotten at the center of these conflicts are the people whose lives, families, communities, and societies are torn apart by external forces. With each air strike and civilian causality, fear and hatred within a society grows. Feelings of revenge manifest into violence with generational implications. AQAP and ISIS prey upon fear and anxiety within Yemen’s populace. They exploit ethnic, sectarian, and economic fissures to create footholds by delivering governance, rule of law, and basic needs where they do not exist. AQAP has thrived in Yemen’s chaos for years and more recently, ISIS has zeroed in on Yemen to expand its regional influence. An article in the latest issue of Dabiq, “The Allies of Al-Qaeda in Yemen,” discusses the Sons of Hadramawt, the new name used by the Yemeni branch of al-Qā’idah. And according to the AEI Critical Threats Project, ISIS now operates in at least eight governorates. At least three children are being killed every day in Yemen, many of them as a direct result of the use of wide-range explosive weapons in villages, towns and cities, according to international children’s charity, Save the Children. Their new briefing, Nowhere safe for Yemen’s children: The deadly impact of explosive weapons in Yemen, reveals that children are being bombarded daily by intensive airstrikes, shelling and rocket attacks. It is calling for civilians to be protected and for all international parties to agree to an immediate ceasefire as well as providing high-level support to UN efforts to find a political solution to the conflict. More than 1,500 children have been killed or injured since violence escalated in March according to the UN, with many of the deaths a direct result of explosive weapons such as missiles and large aircraft bombs, artillery shells, rockets, mortars, and improvised explosive devices (IEDs). Yemen now has the highest number of casualties owing to explosive weapons in the world, following Syria. The briefing includes a range of children’s voices who say they are terrified by the daily bombardment, including 15-year-old Zaid, whose brother was killed by an air strike while playing outside. “As soon as I heard it I ran out of the house to look for him. I saw lots of people standing around the bodies and injured people. Then I saw that my brother was lying on the ground. He was missing his arm and his body was burnt,” he explains. The impact of explosive weapons on children’s smaller, more delicate bodies is particularly severe and they often suffer complex injuries requiring specialist care and surgery. “It’s bitterly ironic that the very health facilities needed to treat injured children have often been damaged or destroyed by explosive weapons themselves,” says Edward Santiago, country director of Save the Children in Yemen. The breakdown of Yemen’s health system means more than 14 million people are now without the basics like antibiotics and vaccines, and risk dying of preventable diseases like diarrhoea, pneumonia and malaria. When heavy explosive weapons are used in populated areas like cities, towns and villages, they expose civilians to predictable and huge risk because of their devastating wide area effects. The UN Secretary-General and the President of the International Committee of the Red Cross in October issued a ‘joint warning’ that called on states to stop using heavy explosive weapons in populated areas. Furthermore these weapons also have a ‘failure rate’ meaning that they could remain unexploded, only for children to pick them up or walk over them, causing loss of limbs or death. Save the Children’s partner organisation YEMAC (Yemen Executive Mine Action Centre) has already begun demining activities in the south, including warning children and their families about what unexploded weapons look like. Alongside mine awareness, Save the Children is also treating malnutrition and providing healthcare, clean water, and psychosocial support to children. The charity is calling for an immediate ceasefire in Yemen. In the meantime, it is urging all parties to the conflict to stop using explosive weapons with wide-area effects in populated areas. “The international community’s reluctance to publicly condemn the human cost of conflict in Yemen gives the impression that diplomatic relations and arms sales trump the lives of Yemen’s children,” Santiago adds. In the seven months since violence escalated in March and November 17th, 637 children have been verified as killed, which translates to three children per day. According to the UN, 4,500 civilians were reportedly killed or injured by explosive weapons in Yemen during the first seven months of 2015: that is more than in any other country or crisis in the world during the same period. The UN has also said that in the second quarter of 2015 nearly three quarters of child casualties (deaths and injuries) were caused by airstrikes. Cyclones Chapala and Megh made landfall in southeast Yemen on 3 and 8 November respectively. The Emergency Telecommunications Cluster (ETC) prepared satellite phones and other security telecommunications equipment to deploy to the affected areas. The ETC signed a Memorandum of Understanding (MoU) with the World Health Organisation (WHO) to provide shared information technology (IT) services to the humanitarian community in Al Hudaydah from WHO premises. System is struggling to provide care for those suffering from chronic diseases Over 14 million people in Yemen are unable to access adequate healthcare and the health system is in a state of collapse. The World Health Organization (WHO) estimates that more than 600 of around 4,000 health facilities have stopped functioning due to a lack of fuel, supplies and personnel. Health facilities and staff are directly suffering from the impact of the conflict: according to WHO, at least 69 health facilities have been damaged or destroyed, eight health workers have been killed and 20 injured since March. With no domestic production of pharmaceuticals, Yemen’s healthcare system is reliant upon imports for essential medicines and equipment. Despite recent improvement in the quantity of imports, restrictions over the last few months have severely impacted the health sector. Shortages in the availability of essential medicine often mean that chronic diseases, such as hypertension, diabetes and heart disease, go untreated. WHO and partners together with humanitarian organisations are assisting hospitals and health facilities with fuel and medical supplies. International organisations are also paying incentives to health workers and supporting the Ministry of Health. “Without the support of international organisations we would not be able to continue functioning”, explains Dr. AlQadasi. The healthcare system urgently requires additional support. Every day, many patients travel to Sana’a seeking treatment, as many health facilities in other parts of the country are no longer functioning. General Manager of the city’s second biggest hospital expressed his concerns. “We are stretched to exhaustion due to the on-going crises and increased caseload. Unfortunately, we have to prioritise the treatment of patients according to the criticality level of their illness” further explained Dr. Qadasi. Some families waiting for hospital beds are able to rent hotel rooms or even houses, but Atef and his family have no other choice but to wait in the parking lot. Im Jemen haben Unbekannte eine Mitarbeiterin des Roten Kreuzes entführt. Die Frau aus Tunesien sei auf dem Weg zur Arbeit in der Hauptstadt Sanaa von Bewaffneten verschleppt worden, teilte die Organisation mit. Ein ebenfalls entführter Mitarbeiter sei nach mehreren Stunden wieder freigekommen. Wer hinter den Taten steckt, blieb zunächst unklar. Gunmen abducted two ICRC staff members on their way to work this morning in the capital, Sanaa. One of them was released unharmed a few hours later. The second colleague is a Tunisian national; she is still being held. "We do not know who is behind this abduction, but I appeal to those responsible to release our colleague as soon as possible," said the ICRC head of delegation in Yemen, Antoine Grand. "It is encouraging that one of our staff members has already been released. Now, I hope, the second one will be freed. We are in Yemen to provide humanitarian help to the people. Actions like this, against humanitarian workers, only make it more difficult for us to provide the assistance the people so desperately need." The ICRC has halted all field movements in Yemen for the time being. NGOs and human rights defenders have come under increased scrutiny and pressure from the Huthi armed group in areas of Yemen under its control over the past six months, said Amnesty International in a new statement published today. At least 27 NGOs have been raided and shut down since the Huthi armed group took control of the Yemeni capital, Sana’a, and human rights activists have reported coming under increased monitoring from the group and even received death threats towards their family members. “By harassing and intimidating human rights defenders and shutting down NGOs the Huthi armed group is fuelling a climate of repression and sending a clear message that dissenting voices will not be tolerated in areas under its control,” said James Lynch, Deputy Middle East and North Africa Director for Amnesty International. Yemeni President Abedrabbo Mansour Hadi reshuffled his cabinet Tuesday, naming new foreign and interior ministers after signs of discord within the government of the war-torn country. Abdulmalek al-Mikhlafi, who leads a team of government peace negotiators, was sworn in as foreign minister, replacing Riad Yassin, the Saba state news agency reported. The replacement of Yassin, who is said to have good relations with Hadi but not with Prime Minister Khaled Bahah, is understood to be aimed at smoothing relations between the president and the premier. “The reshuffle is mainly to replace Yassin who had differences with Bahah,” a source close to the prime minister said. Among other changes, General Hussein Arab was appointed interior minister, replacing General Abdo al-Huzeifi who will lead the country's intelligence services, Saba said citing presidential decrees. Hadi also named a new minister of transport, Salah al-Shanfara, who told AFP that he had rejected the nomination. “I am head of the Supreme Council of the Southern Movement and we are in revolution and will not accept positions,” he said, referring to the secessionist movement that wants independence for Yemen’s south. Kommentar: Die Differenzen mit Vizepräsident Bahah übernimmt die saudische Agentur nicht, so einfach geht das. Yemeni Prime Minister Khaled Bahah rejected a cabinet reshuffle ordered on Tuesday by President Abd-Rabbu Mansour Hadi, a senior government official said, another sign of the deepening rift between the two leaders. Hadi said earlier on Tuesday he was replacing five ministers, including acting foreign minister Reyad Yassin Abdulla, according to a decree carried by the Hadi-run state Saba news agency www.sabanew.net. "A personal announcement will be issued rejecting the ministerial changes because they are illegitimate," the source told Reuters, adding that Hadi had made the changes without consulting Bahah, who is also the vice president. Differences between Hadi and Bahah have deepened since the president appointed minister of health Abdullah as acting foreign minister in March without consulting the prime minister, officials close to Bahah said. They said Bahah had since refused to recognise the appointment and did not allow Abdulla to attend government meetings. Aides close to Bahah also accuse Hadi of trying to scuttle any settlement of the crisis, fearing a solution would speed up his departure from the presidency. Hadi was elected for an interim period under a Gulf power transfer deal that had eased his predecessor, Ali Abdullah Saleh, out of office following months of protests against his 33 years in office. Hadi's supporters accuse Bahah of inefficiency and failure to deliver on reconstruction of Aden after the Houthis were driven out. Commentary: Over the past few months it has been speculated that Bahah will replace Hadi as president. Balah has definitely a higher profile in Yemen, having been in Aden for some months. Now we see a few cracks in their relationship emerging. With the conflict escalating in Yemen, MSF’s Dr Mahmood Menapal spent four months in Taiz, a city on the frontline. Having grown up in Afghanistan, however, and having survived a bomb attack in Pakistan, he was undaunted by working under airstrikes and sniper fire. I didn’t have much fear, as I’ve lived in this situation before. I grew up in a war zone in Afghanistan, so being in Yemen wasn’t terrifying. But I was really worried about the snipers. Snipers and fighters don’t discriminate between a fighter and a civilian, so people were too scared to move around the city. We couldn’t see where the snipers were located, but it was clear from our patients’ wounds that the snipers were shooting to kill. We treated many patients with injuries from snipers’ bullets, and most had chest and head wounds. The Saudi-led, U.S.-backed war on Yemen has always had the dubious goal of restoring Hadi, the deposed president, to power. Hadi has little support inside Yemen, and his backing for the bombing campaign over the last eight months has made him even less popular. Most of the Yemeni forces that are nominally fighting to restore his government don’t really want him in power, and it seems clear that any lasting settlement of the conflict won’t include him as president. So naturally Hadi is doing his best to derail negotiations that might eventually produce such a settlement U.N.-sponsored peace talks were already supposed to have started last month, but the coalition has shown little interest in negotiations all year and Hadi has shown even less. Because reimposing Hadi has been one of the major stated goals of the Saudi-led intervention, it may be difficult for the Saudis to cast him aside, but that is part of what an enduring peace settlement would require. Pressuring the Saudis to recognize this and to get them to withdraw their support for Hadi is something constructive that the Obama administration could do if it were willing to try. Unfortunately, everything we have seen from the administration on Yemen this year tells us that they won’t be. When administration officials are publicly praising and defending the intervention, we shouldn’t expect them to be doing very much to end it. Efforts to launch peace talks to end an eight-month-old war in Yemen are being thwarted in part by Saudi-backed President Abd-Rabbu Mansour Hadi, who fears a negotiated settlement would drive him from power, diplomats who follow Yemen said. Like his opponents, Hadi says he is committed to U.N.-led talks to end the war in one of the Arab world's poorest countries. But diplomats following the peace process say he is increasingly an obstacle, raising pressure on his Saudi sponsors to withdraw their support or help shunt him aside. "Hadi has been trying to block any kind of talks because he knows that any settlement will be the end of this political career," said one diplomat who follows Yemen, speaking on condition of anonymity. "Hadi has never been popular and it’s not in his interest that the war stop before complete victory. Diplomats know that Hadi is not a serious candidate, and a settlement means he’s out." A second diplomat said there was now broad agreement that talks were the way forward because the war had reached a stalemate on the ground. But "a few dissenters" including in Hadi's camp were nonetheless holding out for a military victory. "And since that is seen as elusive, they are seen to back the conflict because a peaceful solution has nothing to offer for them." Hadi strongly denies he is being obstructive. Even before Hadi was driven out of Sanaa by the Houthis, the new president had developed a reputation as a weak leader who failed to bring rival militias to heel or curb corruption. Commentar<: This man is despicable. Of course he will no longer be in power if Yemen manages to negotiate for peace. Very few support him for God's sake except for the international powers - and why should they be able to inflict Hadi on an unwilling Yemen whose people have suffered so much because of him. He is one of the few unifying factors in a polarised Yemeni society - unified in saying NO NO NO. And meanwhile more killing at his behest goes on and on and on. Der deutsche Bundesnachrichtendienst (BND) warnt vor einer destabilisierenden Rolle Saudi-Arabiens in der arabischen Welt. “Die bisherige vorsichtige diplomatische Haltung der älteren Führungsmitglieder der Königsfamilie wird durch eine impulsive Interventionspolitik ersetzt”, heißt es in einer Analyse des deutschen Auslandsnachrichtendienstes. Vor allem die Rolle des neuen Verteidigungsministers und Sohns von König Salman, Mohammed bin Salman, wird vom deutschen Auslandsgeheimdienst kritisch gesehen. Die wirtschafts- und außenpolitische Machtkonzentration auf den Vize-Kronprinzen “birgt latent die Gefahr, dass er bei dem Versuch, sich zu Lebzeiten seines Vaters in der Thronfolge zu etablieren, überreizt”. Mit seinem Militäreinsatz im Jemen wolle Saudi-Arabien beweisen, dass es bereit sei, beispiellose “militärische, finanzielle und politische Risiken einzugehen, um regionalpolitisch nicht ins Hintertreffen zu geraten”, schreibt der BND. The King Salman Center for Relief and Humanitarian Aid distributed 5000 food baskets to the needy in Yemen's Taiz Province. The distribution was carried out by the Islamic Relief Commission, the Islamic Relief Coalition, and local organizations. The 5000 food baskets are part of a 130,000 food basket allotted for Taiz Province, in addition to the overall food security program implemented by King Salman Center to assist all the needy in all parts of Yemen in collaboration with the World Food Program at a total amount of more than $140 million. Kommentar: In Relation zum Luftkrieg setzen. Erst Bomben und totale Blockade, dann Fresspakete. Three quarters of the value of all official gifts given to the US administration in 2014 came from Saudi Arabia, according to US government records. US President Barack Obama, First Lady Michelle Obama, their daughters and US federal government employees received official gifts estimated to be worth a total of $3,417,559 last year. Analysis of the annual disclosure, released by the US Department of State’s Office of the Chief of Protocol, found Saudi Arabia gave the US gifts valued at around $2,566,525. It dominated the report and represented 75 percent of the value of all gifts received by Obama and his government employees last year. When all other Arab countries are added to the mix the total value rises to nearly $3 million, with the Arab region accounting for 87 percent of the value of all gifts. The most lavish gift was an emerald and diamond jewellery set containing a ring, earrings, bracelet, and necklace, which was valued at $780,000. It was not given to Obama, his wife Michelle or his children, but Teresa Heinz Kerry, wife of US Secretary of State John Kerry. The jewels were given to Mrs Kerry in January 2014 by the late King Abdullah bin Abdulaziz Al-Saud. That has been accompanied by a spending spree on American lobbyists with ties to the Washington establishment. The Saudi Arabian Embassy, as we’vereported, now retains the brother of Hillary Clinton’s campaign chairman, the leader of one of the largest Republican Super PACs in the country, and a law firm with deep ties to the Obama administration. One of Jeb Bush’s top fundraisers, Ignacio Sanchez, is also lobbying for the Saudi Kingdom. The Saudi Arabian embassy, which did not respond to a request for comment, has been particularly busy wooing Washington in recent months. Ibish also predicted that Saudi Arabia was prepared to “intensify efforts to influence events in Syria.” In reality, the Kingdom ended its airstrikes in Syria that month as it has channeled military resources into the war in Yemen instead. The Times identified Ibish as a “contributing opinion writer” and a senior resident scholar at the Arab Gulf States Institute, but offered no hint about the institute’s financial backing. 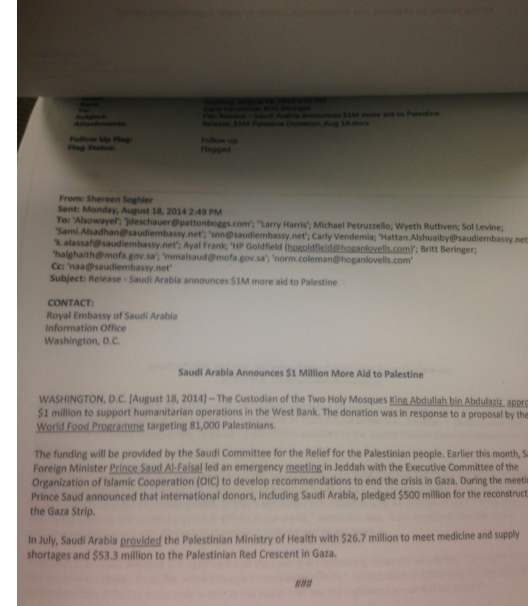 Qorvis’ email blasts to the media have been coordinated with Saudi Arabia’s team of contracted lobbyists, including H.P. Goldfield, a lobbyist with the law firm Hogan Lovells and vice chairman of Albright Stonebridge Group. Arabia Now purchased promoted tweets in the D.C. area. Qorvis also coordinated the payments of honorarium to prominent political figures. For instance, Mark Kennedy, a former Republican congressman from Minnesota, received $2,000 for a speech. From April through September of this year, Qorvis billed the Saudi government for nearly $7 million, more than twice the amount charged the previous reporting cycle. In early October, Saudi officials hosted several events for policymakersaround Washington. Prince Sultan bin Khaled Al Faisal, a former Royal Saudi Naval Forces commander, spoke at an event in the Rayburn House Office Building. Terrorists like to believe they are committing mass murder for a noble political cause. Islamic State (IS) acolytes believe they are fighting against the evil “Crusader” states of the kuffar (disbelievers) to establish a global khilafah (caliphate). “War on terror” proponents believe they are defending Western civilisation against barbaric terrorists hell-bent on destroying our “values” and “way of life”. Both frames depict the enemy in sub-human terms, as barbarians outside the gate. Both justify colossal destruction of civilian life as necessary and inevitable to obtain noble political goals. In the aftermath of the Paris attacks, once again, people wondered, debated: how can people become so unfathomably evil that they deliberately commit mass violence against innocent civilians? The answer is simple: dehumanisation. Killing is easier when those you are killing are categorised as existing somehow outside the frame of one’s own humanity, and thus, less than human, Other. Claims that these constant terrorist attacks – slaughtering innocent American, British, French and other Western citizens every few days and weeks – were in any way justifiable by Western foreign policies would be roundly rejected as morally bankrupt. Yet this is already happening. Do these weasel words prove that there have been no civilian casualties from UK drone strikes? No, because there is a reason the MoD has no list of “known cases of civilian casualties”: as a matter of policy, the British Army does not keep track of civilian casualties. Institutionally, the British government has no idea how many Iraqi civilians have been killed since UK military operations began in that country in 2003. In fact, the Ministry of Defence has no formal mechanism to track civilian deaths from any of its military operations in Iraq, Afghanistan, Pakistan or anywhere else – in violation of its obligations under the Geneva Conventions. We now know that the picture of “precision” drone strikes surgically targeting and decapitating terrorist leaders is a total mythology. The British government is risking its status as a global humanitarian power by continuing to sell weapons bound for use in Yemen, where the conflict is killing three children every day, Save the Children has warned. In a strongly worded intervention accompanying a report on Yemen, the international charity has accused the UK of appearing to put politics and profit above the protection of children. In its report on the proliferation of explosive weapons, entitled Nowhere Safe for Yemen’s Children, Save the Children concludes that the widespread use of such arms has now afforded Yemen “the dubious status, alongside Syria, as the most dangerous place in the world for explosive violence as of November 2015”. The report has collected testimony from children who have witnessed the death and destruction caused by airstrikes and shelling. Two years later the Saudi Arabian-led coalition began its aerial bombardment of Houthi rebel controlled areas of Yemen. The continuous, indiscriminate and disproportionate airstrikes have rained down on the country for six months, killing hundreds and injuring hundreds more, with ongoing replenishments of British weaponry. Along with other human rights organisations, we have been warning the government for months that the coalition has been committing war crimes – but their response has been pitiful. Instead of investigating the alleged crimes, or better yet suspending arms sales until they can be sure certain UK weapons won’t be used to indiscriminately attack civilians, the government is accepting the ‘assurances’ of Saudi Arabia as reason enough to keep giving them weapons. These ‘assurances’ hardly seem credible when Saudi Arabia blocked a UN resolution for an independent investigation into war crimes in Yemen. Finally, the Foreign Secretary Phillip Hammond admitted during a Newsnight interview that Saudi Arabian assurances alone would not be enough to prove breaches of international law had not occurred. Instead, there will be an investigation into the reported breaches… by Saudi Arabia. Allowing the accused to investigate their alleged crimes is certainly a novel and potentially cost-saving idea, but it is not the approach of a government that is committed to easing the human suffering caused by armed conflict around the world. The UK government is turning a blind eye to its complicity in civilian casualties and deaths in Yemen. It continues to dismiss multiple and consistent reports of hospitals destroyed, markets flattened, cluster bombs scattering effective landmines as insufficient to prove the Saudi-led coalition is not taking the necessary steps to protect civilian life. The government stubbornly argues it is in the right, and not until irreproachable proof of a breach of international humanitarian law lands in its lap will it stop its transfer of arms. But this is not the principle of the Arms Trade Treaty. The Treaty exists to prevent such breaches happening, to protect civilian life in conflict. Countries signed up to the treaty must assess the risk of a breach, the potential that arms could be used indiscriminately. This risk and this potential is evident, and the UK has offered no reasoning as to why it believes otherwise. Ground fighting between Huthi and Governmental forces does not distinguish between military targets, and homes and hospitals. Air strikes have pummelled neighbourhoods despite there being no hint of Huthi rebel presence. On 9 July, an airstrike bombed a school north of Aden, when a dozen families displaced by the conflict were sheltering. Ten members of the Faraa family, including four children and five women, were killed. This is not a conflict to which the UK can stand back and claim its hands are clean. The Saudi Arabian coalition is using our weaponry and our technology to attack civilians. The UK’s relationship with Saudi Arabia is an important one, but no political relationship justifies the death of a Yemeni person caused by a British manufactured bomb. The UK’s safety and trade must not be built on the deaths of innocent people in a country and a conflict we would rather ignore. The UK was a leader in bringing about the Arms Trade Treaty. But its conduct in the Yemen conflict is undermining its good work and its reputation. It is indefensible to argue that we should only stop providing a country with arms when it has confessed to breaches of international humanitarian law. The UK cannot pick and choose when the law applies – it must apply to everyone, friend and foe alike. Yemen is the new Syria. The human cost of the Yemeni armed conflict is staggering. Yemen is considered to be key to stabilizing the Middle East, and an important conduit of humanitarian aid to the Horn of Africa. Many countries, including Brazil, are condemning the escalating violence there. The Brazilian government recently urged dialogue to solve the crisis, and it previously signed agreements with Yemen to promote food security, agricultural development and school programs. But what keeps the bloody affair going is a relentless supply of weaponry from foreign powers. According to Armament Research Services (ARES), a private research group, the Brazilian weapons recently documented in Yemen are SS-60 MK 4 cargo rockets, a type of cluster munition. They were launched from an ASTROS multiple-launch rocket system. Each rocket contains numerous smaller munitions, known as submunitions, which are dispersed over the target area with the intention of detonating on contact. Saudi-Arabiens Potentaten sind für die deutsche Wirtschaft willkommene Investoren und Kunden. Die Nähe zum Terror stört dabei kaum jemanden. Muss das sein? In einer der gefährlichsten Weltregionen sucht die westliche Politik Stabilitätsanker, Vermittler mit Kontakten in eine Welt, die aus den Fugen geraten ist. Und seien sie auch noch so fragwürdig. Wer wen in dieser Gemengelage unterstützt, ist kaum einzuschätzen. Mit dem sogenannten „Islamischen Staat“ (IS) will offiziell niemand in Verbindung gebracht werden. Qatar, das Land mit dem höchsten Pro-Kopf-Einkommen der Erde, stemmt sich nach Kräften gegen diese Gerüchte. Die Kämpfer der radikalislamischen Al-Nusra-Front aber, die sich zu Al Qaida bekennen, haben die Qatarer im Kampf gegen den syrischen Diktator Assad sehr wohl unterstützt. Auch Vertretern von Hamas und Taliban biete das Emirat Unterschlupf in der Hauptstadt Doha. Dem Königreich Saudi-Arabien stehen die IS-Brandschatzer zwar ideologisch nahe, lehnen aber die Herrscherfamilie Saud ab. In dem islamischen Gottesstaat, der seine Ideologie in die ganze Welt exportiert, werden Kritiker ausgepeitscht, Kirchen und Synagogen sind verboten, die schiitische Minderheit, Frauen und Homosexuelle werden diskriminiert. Bei Gotteslästerung droht die Todesstrafe. „Westliche Werte“, wie sie nach den Anschlägen in Paris allenthalben beschworen wurden, zählen weder beim IS noch in Saudi-Arabien. Kritik aus der Politik hält sich dennoch in Grenzen. Und was der Politik recht ist, ist der Wirtschaft billig. […]Wenn Politik kaum moralische Standards setzt, haben auch die Unternehmen freie Bahn. Selbst vor Waffengeschäften mit den Golfstaaten schreckt Deutschland nicht zurück. Im ersten Halbjahr 2015 lieferten deutsche Unternehmen nur nach Großbritannien und Israel mehr Rüstungsgüter als nach Saudi-Arabien. Mit knapp 180 Millionen Euro hatten diese Exporte ein beinah dreimal so großes Volumen wie im Vorjahreszeitraum, offenbart der Rüstungsexportbericht des Wirtschaftsministeriums. Geliefert wurden unter anderem „Fahrgestelle für unbewaffnete Transporter“ und „Teile für Kampfflugzeuge“. Auch Qatar steht auf der Liste der Kunden. Kommentar: Was ist “dieLegitimität des Jemen?“ Propagandasprech. Arab coalition forces and their Yemeni allies will pursue a military campaign to end an Iranian-backed coup until the rebels agree to join UN-sponsored peace negotiations; the coalition spokesman was reported on Tuesday as saying. “Halting the military operations is up to the Houthis and their allies…if they want to end this war and go to the negotiating table, then it will end…otherwise the operations will continue until security and stability in Yemen and its neighbors is achieved,” Brigadier Ahmed Assiri said, quoted by Rotana Gulf satellite TV channel. He said the war, which has entered its ninth month, has dragged on because the insurgents have strong military capabilities. But he stressed that the Saudi-dominated coalition as well as the national Yemeni army and the resistance would not stop the war before the rebels agree to peace terms. “We are in a war against a large force which has a large number of men and large military capabilities…we are fighting the Houthis and their allies, including part of the Yemeni regular army and the Republican Guards, and the Central Security Forces…they are trained forces and have capabilities that surpass those of some Arab countries,” the Saudi army general said. Kommentar: Die Koalition macht weiter Krieg bis die Huthis zustimmen, an den Friedensgesprächen teilzunehmen: Das haben sie schon längst getan, im Grunde schon seit Monaten zu den früheren Gesprächsterminen; wer die Gespräche oder die Ansätze dazu immer wieder hat platzen lassen, waren Hadi-Regierung und Saudis. Dann wird der Feind stark geredet, um die eigene Heldenhaftigkeit und die Notwendigkeit zu großen Anstrengungen herauszustreichen. Und dann wird auch noch UN-Resolution 2216 herausgeholt, das Killer-Argument für jede Friedensverhandlungen (wie hier schon öfter von mir ausgeführt. The fact that Salvadorans form part of the mercenary armies operating in Yemen is an open secret. A military intelligence source from the Salvadoran Ministry of Defense, speaking on the condition of anonymity, confirmed to the Americas Program that there are 100 Salvadorans carrying out operations of that type in Yemen. According to the high-ranking official, starting several months ago Salvadoran mercenaries, both officials and rank-and-file soldiers of the Armed Forces of El Salvador, are being hired by a company known as “Torogoz” to carry out private security tasks in the Middle East. The Americas Program attempted to contact the company, but found no official registration of its existence. The military source said that once the candidates satisfy the requirements, they travel to Dubai. From there they are sent to special training in Yemen, and then integrated into one of the two battalions that are made up of Colombians, Mexicans and other Latin Americans. Asked about overseas operations, Captain Rebeca Calles, spokeswoman for the Salvadoran military, told the Americas Program that the Armed Forces of El Salvador officially have troops stationed in Mali, where they carry out peacekeeping and health operations with the approval of the Salvadoran Congress and President Salvador Sánchez Cerén. Calles explained that due to the fact that El Salvador has signed various international treaties, it can authorize soldiers to participate in joint operations around the world when the United Nations (UN) asks for its support. In the Yemen case, because the soldiers are contracted by a private company, which in turn is subcontracted by an international private company, the former soldiers do not need special authorization to work as security forces in another country. The military intelligence source also said that one of the businesses that subcontracts the Salvadoran company to send personnel is Northrup Grumman, a Virginia-based company that in 1997 won an international contract to build an air traffic control system for the International Airport in El Salvador. No one seems eager to talk about the subject in El Salvador. Another military intelligence source, who also spoke to the Americas Program under the condition of anonymity, said that “the Yemen issue” –and the recruitment of Latin American mercenaries–is something generally known about but kept under wraps. “I don’t know if they are using soldiers, as some in the media say, or if they are extramilitary mercenaries. I suppose that there is an abundance of former soldiers that fought in Colombia against the FARC,” said the anonymous source. Kommentar: Noch ein zusammenfassender Artikel zum Thema, das wir schon ausführlich hatten. Fast derselbe Text bei der iranischen Agentur und dem konservativen US-Sender! l Qaeda have retaken the two major southern Yemeni towns of Zinjibar and Jaar that had fallen briefly to militants four years ago, residents and local fighters said on Wednesday. Residents said the militants launched a surprise attack and clashed with the local forces, known as popular committees. The militants then set up checkpoints at the entries to the towns and announced over loudspeakers after dawn prayers their takeover of both towns. Jaar and Zinjibar, the capital of Abyan province, are about 50 km (30 miles) east of the main port city of Aden. They had fallen previously to militants from al Qaeda in the Arabian Peninsula in 2011. "The entrance of al Qaeda this time happened in the absence of any state institutions, which al Qaeda exploited," said Zinjibar resident Fadl Mohammed Mubarak. Al Qaeda's affiliate in Yemen threatened the Saudi government over its plan to carry out a mass execution of prisoners, including al Qaeda members, the militant group announced in a statement posted on social media. Al Qaeda in the Arabian Peninsula (AQAP), one of the deadliest branches of the global militant network, said it was aware of Saudi intentions to execute its members in Saudi prisons and pledged to carry out attacks in response. Yemen’s civil war is allowing the Islamic State (IS) to expand its presence there. Amid the spread of extremism engendered by the conflict between the Houthis and the central government, IS is becoming the main adversary for both the Houthis and al-Qaeda in the Arabian Peninsula (AQAP). IS is strengthening its footprint in the northern, Houthi-controlled governorates and is making progress in the south, although al-Qaeda remains the dominant force there. Attacks by armed pro-IS groups rose in October, after they pledged allegiance to IS leader Abu Bakr al-Baghdadi in the capital, Sanaa, and other cities in the country’s south and southeast. As a result, their activities gained an added dimension, as they attempted to impose themselves as effective instigators of violence on the Yemeni scene. These groups attacked government troops as well as those they describe as Shiite, Iran-backed Houthis. The growing level of violence is strengthening IS and putting it on a direct collision course to replace AQAP as flag bearer for the Holy War against their enemies. Both groups seek to take advantage of political and sectarian instability. As a result, the influence — even the mere existence — of the Ayman al-Zawahiri-led al-Qaeda is threatened. IS’ combat tactics rely on taking control of a specific geographic region, as was the case in Iraq and Syria, as a prelude to launching attacks against other areas — a feat it has failed to accomplish so far in Yemen. Yet it succeeded in establishing training camps for its combatants in mountainous regions of southern Yemen. IS revealed that feat in a November statement detailing how its troops, trained in the southern city of Lahej, attacked a government military camp in Hadramaut. In parallel, disputes erupted between the two organizations following the assassination of a number of high-ranking AQAP leaders in drone attacks. However, to date, no direct, physical clashes have been reported between al-Qaeda and IS in Yemen. The dispute has remained confined to verbal barbs and the avoidance of armed confrontations. Furthermore, there are indications that a number of AQAP members have defected to IS. The number of IS combatants is kept secret, as are their locations or hideouts — particularly in light of them successfully infiltrating the security measures of coalition and government forces in Aden, as well as the strict security measures adopted by the Houthis in Sanaa. The Saudi fighter jets killed tens of civilians in the city of Ta'iz as the Yemeni army and popular forces have staged continued advances in the province of Ta'iz for the past several days. "The Saudi airstrikes hit the regions where the popular forces were scattered, but they killed at least 70 civilians and injured dozens more," a popular forces' commander Abdelnour al-Mansour told FNA on Tuesday. He underlined that the popular forces are present in different residential areas of Ta'iz province to confront the Saudi-led forces and pro-Hadi militias. Al-Mansour noted that the Yemeni forces killed a large number of Saudi-led forces in the clashes on Monday. He said that three commanders of pro-Saudi terrorists were also killed in clashes with the Yemeni forces on Monday. "Abde al-Atfi, Mahmoud al-Jubihi and al-Fanahi were killed in clashes with the Yemeni forces yesterday," Al-Mansour said. Saudi air Saudi fighter jets bombed a residential neighborhood in the al-Talah district in the province of Sa'ada, killing four women and injuring eight others. A woman was also injured in Saudi airstrikes on a residential area in Saqin district in Sa'ada. Two children were also killed and as many injured in Saudi air raids in the al-Misrakh district in the province of Ta'iz. Meanwhile, Saudi jets targeted two residential buildings in al-Sahoul area in Ibb province, killing and injuring a number of civilians, including women and children. Saudi warplanes also launched airstrike on al-Naqalin area in Ibb. The latest Saudi air raids targeted Harad district in Yemen’s Hajjah province. This after airstrikes on a village in Ta’izz province killed a child and wounded another. Earlier, at least four Yemenis were killed and two others injured in Saudi airstrikes on a residential region in Ibb province. Bei den Luftangriffen der von Saudi-Arabien angeführten arabischen Militärallianz am Sonntag auf die Frauenversammlung in der Stadt al-Masrakh in der Provinz Taiz sind 11 Frauen getötet, und mehrere verletzt worden. Laut der staatlichen jemenitischen Nachrichtenagentur SABA griffen saudische Kampfflugzeuge mehr als sechs Mal verschiedene Regionen in dieser Provinz an, wobei auch Wohnhäuser und staatliche Gebäuden beschädigt wurden. Dies ist das zweite Mal innerhalb der vergangenen drei Tage, dass bei den saudisch-geführten Luftangriffen auf Jemen Zivilisten getötet werden. Bei dem Angriff am Samstag wurden 12 Zivilisten in der Stadt Mozah, in der Provinz Taiz getötet, und weiter 25 verletzt. At least eight civilians have lost their lives and several others sustained injuries in Saudi airstrikes against various areas in Yemen. Two children were also killed and as many injured when Saudi military aircraft pounded the al-Misrakh district in the southwestern Yemeni province of Ta’izz. Dozens of Yemeni Houthi fighters were killed during an assault on the border with Saudi Arabia, residents and Saudi state television said on Tuesday, in what they described as a major push to try to capture territory inside the kingdom. The Houthis have been trying to push into Saudi territory since an alliance led by Saudi Arabia intervened in Yemen's civil war in March, trying to drive back the Iran-allied group and restore exiled Yemeni President Abd-Rabbu Mansour Hadi. "There was an attempt, as usual, to breach the border and sneak into Saudi territory but the ... armed forces as a whole, were watching them and this attempt was thwarted," Brigadier General Ahmed al-Assiri, spokesman of the Saudi-led coalition, said in comments broadcast by Saudi state television on Tuesday. "Those who tried to infiltrate were killed and the situation is stable, thanks be to God," he added. The channel said Assiri put the number of those killed at 180 Houthis and allied fighters loyal to former President Ali Abdullah Saleh. That number could not be independently verified, but local residents said dozens of Houthi fighters had been killed in what they said was a major assault by hundreds of Houthi fighters on the border. Saudi forces used helicopters as well as rockets to repel the Houthis, they said. The Houthi-run Saba news agency said that fighters had seized three Saudi military outposts near the city of Najran, destroying several armored vehicles, including two U.S.-made Abrams tanks and three Bradley vehicles. Kommentar: Die Siegesmeldungen beider Seiten widersprechen sich völlig. On Monday evening, security sources in the province of Hajjah confirmed that Yemeni forces have carried out a vicious attack on the border post in Tawwal, known as “Tawwal Land Port”. The source told Khabar Agency that fierce clashes took place at the border post between the Yemeni Army and Popular Committees on one hand, and Saudi border guards backed by Royal Saudi Land Force on the other hand. He indicated that Saudi military forces responded violently using tanks, artillery, and sniper units, as well as F-16 and Apache helicopters in the battle after Yemeni forces made a rapid advance. The battle in Tawwal Port has cost more than 106 casualties since this morning, with at least 7 Saudi troops killed and 85 injured, with an addition of 5 Saudi border guards killed and 9 injured. Saudi media claims that dozens were also killed from the Yemeni side. The Yemeni source said that the Army and Popular Committees have launched a military operation and described it as “extension” to the southern areas of Saudi Arabia, where it has been experiencing fierce fighting – they have managed to seize many Saudi military positions recently. If the strategic border post is taken, Yemenis will have full access to the main border highway route connecting Saudi’s Tawwal and Yemen’s Haradh that ultimately lead to the contested city of Najran. Commentary: This is another story about the Yemeni assault on the southwest corner of Saudi Arabia, in retaliation for the Saudi assault on Yemen. This bit of land was traditionally Yemeni territory, conceded by Saleh in 2000 after a prolonged boundary dispute. It is difficult to get accurate information because there is heavy propaganda in this war, but I feel certain that Yemen is making inroads. The Yemen army have said that they will withdraw when Saudi withdraws from Yemen. Moments ago in the Saudi city of Najran, the Yemeni Army’s Republican Guard – backed by the Houthis – imposed full control over 3 Saudi military sites after a series of intense firefights with the Saudi-led Coalition Forces on the border of Yemen. According to a battlefield journalist, the Saudi-led Coalition Forces suffered heavy casualties near the southeastern perimeter of Najran, resulting in their subsequent withdrawal from 3 military sites before the Saudi Air Force’s F-16 fighter jets pounded the Yemeni Republican Guard and the Houthis. In the last 48 hours, the Houthis and Republican Guard have made several advances along Najran’s southern axis, leaving the Saudi-led Coalition Forces in a world of trouble. Kommentar: Wieder Erfolgsmeldungen beider Seiten.